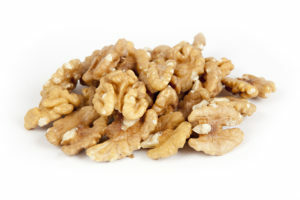 The walnut crop has come in around 45,000-50,000 tons short of the estimate of 650,000 tons. The crop had a higher percentage of dark kernel most likely come in around 620,000 tons, totalling about 9.6% down from last year’s crop of 686,000 tons. The crop was late by about 2 weeks this year causing a slow down in shipments for the first couple of reports. As of right now the industry is behind last year’s shipments 30 percent on in shell and 12 percent on kernels. As a reaction to the crop being shorter than the estimate prices jumped about 50 cents per lbs. Combo material has been s compared to what we’ve seen the past few years. The light material that was produced was good quality with higher than average half counts. The overall crop will very difficult to find and prices for combo have stayed firm over the course of the marketing year since Harvest started. There seems to be some continued pressure on chandler kernels and high half count products. This coupled with the mounting pressure to perform this month on shipments we will learn a lot about the industry in about a week once the shipment report is released. Until then most buyers are waiting to see what California shipped in December before making their nearby purchases.